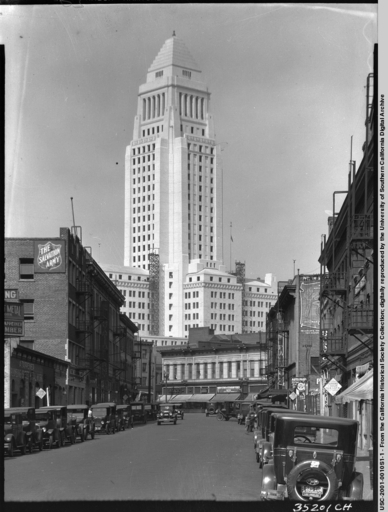 Looking north up Weller Street toward the tower of the former Los Angeles County Courthouse (1891-1935). Harold Lloyd’s debut two-reel comedy featuring his ‘Glass Character,’ Bumping Into Broadway (1919), appears in a sparkling restoration as part of the new Criterion Collection Blu-ray release of Speedy (1928). 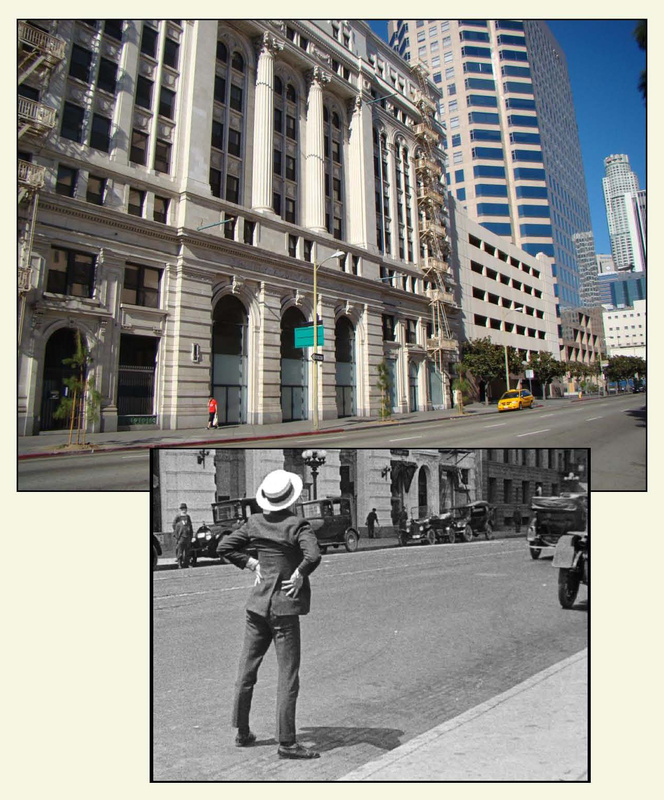 Lloyd filmed many scenes in downtown Los Angeles, including Weller Street (see above), and before the Trinity Auditorium, still standing at 851 S. Grand Avenue (see below), as well as on Bunker Hill (for more details see my book Silent Visions). At right, a matching late 1920s view of Weller Street, showing how the newly completed City Hall blocks the old court house from view. USC Digital Library. Part of Japantown, Weller is renamed today ‘Astronaut E.S. Onizuka Street,’ honoring the first Asian-American to reach space, who was among the crew of the Challenger space shuttle disaster. Harold on Grand Avenue before the Trinity Auditorium, 851 S. Grand Avenue. During an era before zoning laws were passed, you will often see homes adjacent to shops and even factories in the background of silent films. 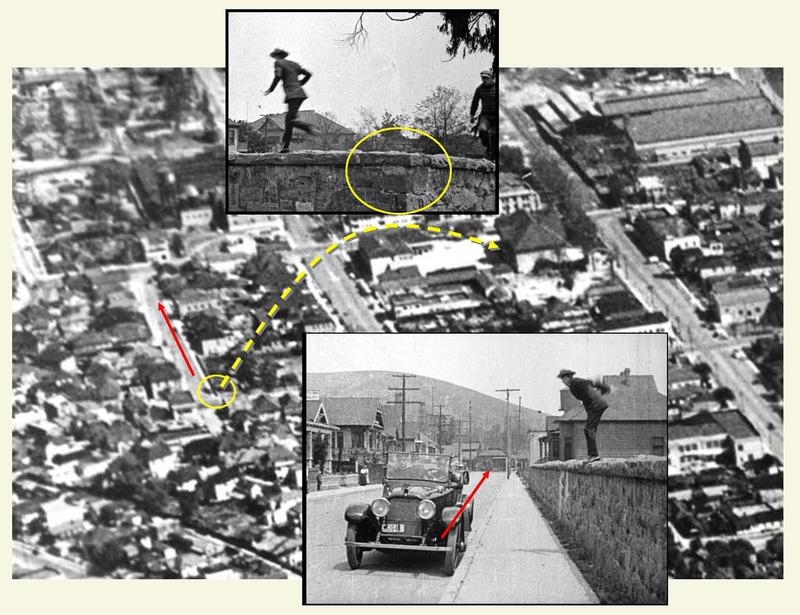 One scene early in Bumping Into Broadway had long captured my attention, as Harold jumps from a stone wall into the back of a limousine convertible. In the background are many homes, a hill, and even oil derricks (left)! I long suspected this scene was filmed to the NW of downtown, perhaps in the hills leading up to Chavez Ravine. Thanks to the remarkable clarity and resolution of the new Blu-ray release, I was finally able to track this down. 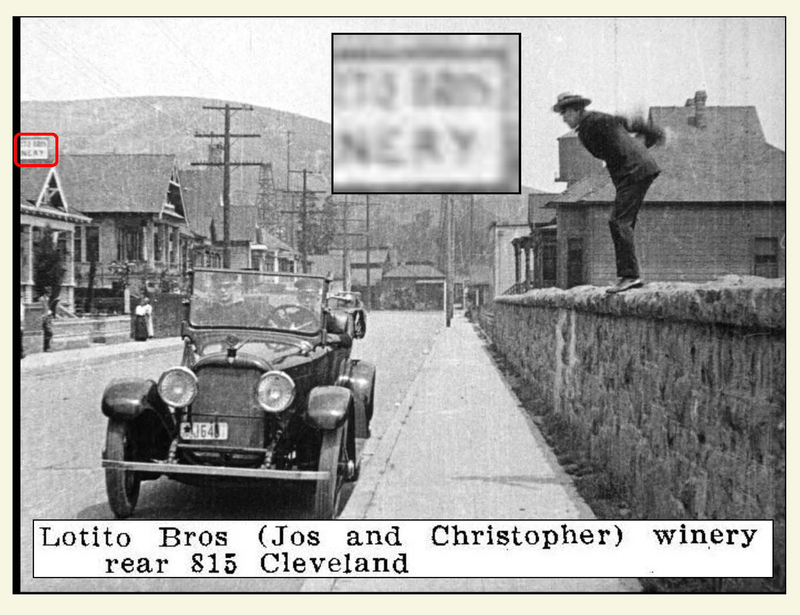 At back I noticed a portion of a rooftop sign reading “ITO BROS … NERY.” I searched for ‘wineries’ in the 1918 online city directory provided by the Los Angeles Public Library, and quickly found the Lotito Bros. at the rear of 815 Cleveland. Checking the Sanborn maps, and some vintage aerial photos, I confirmed this was the correct spot. 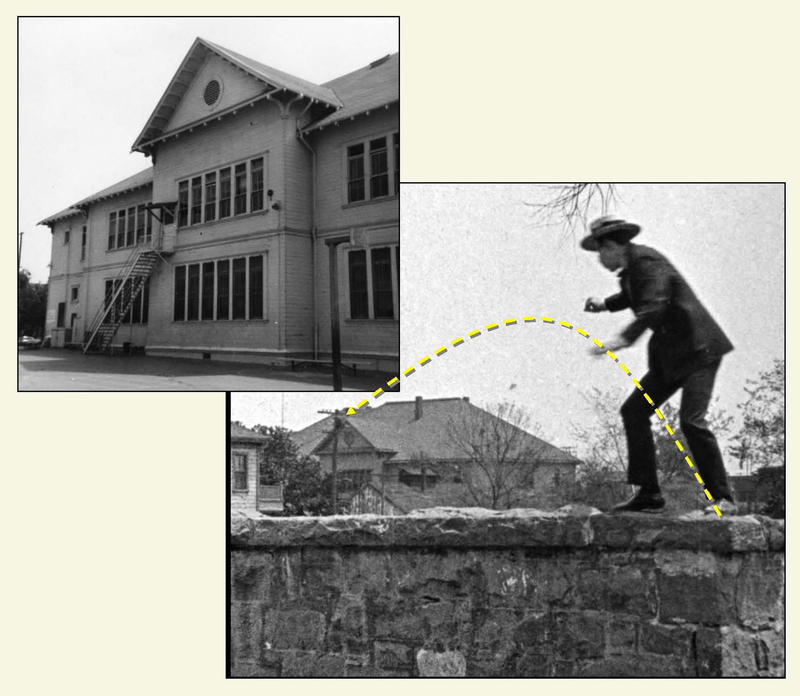 Harold’s corner stone wall marked the perimeter of the former Los Angeles Orphans Home at Yale and Alpine. Huntington Digital Library. Harold’s corner stone wall, at Cleveland and Alpine, was up the street from the former Los Angeles Orphans Home that stood at the corner of Yale and Alpine. By 1913 the former orphanage was used as the headquarters to the Partido Liberal Mexicano (PLM), and was called La Casa del Obero Internacional, or International Workers Home, which offered lodging, community services, and cultural activities. The PLM was formed by brothers Ricardo and Enrique Flores Magón, who played an instrumental role in the Mexican Revolution (1910 – 1920), who settled in Los Angeles in 1910. 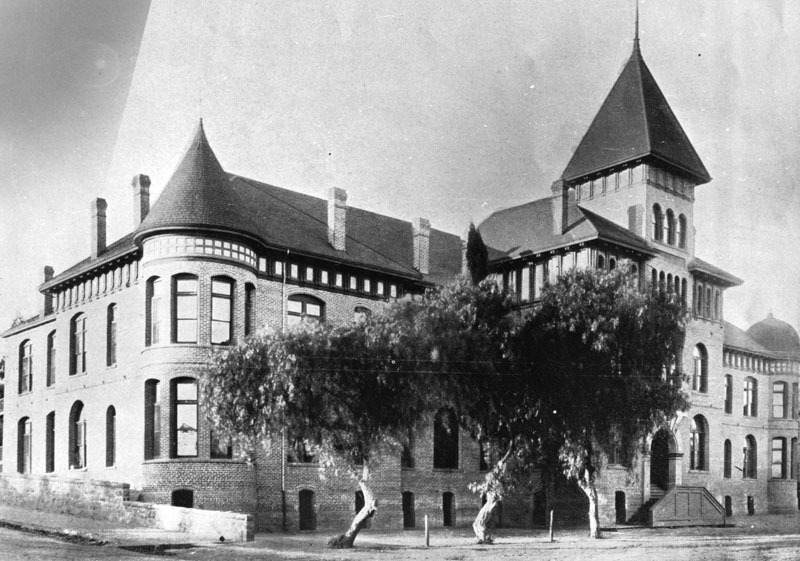 A closer view of the former orphanage, once standing at 807 Yale Street, appears to the right (LAPL). According to the Los Angeles online building permits, the orphanage was demolished in 1917, and by 1919 was replaced with a one story garage. But its stone perimeter wall remained for Harold to play on. Behind Harold, the former Castelar Street School appears at back. LAPL. Harold’s orientation at the corner of Alpine and Cleveland also confirms that the back of the former Castelar Street School, that once stood at 851 Castelar, appears behind him in a different shot (above). 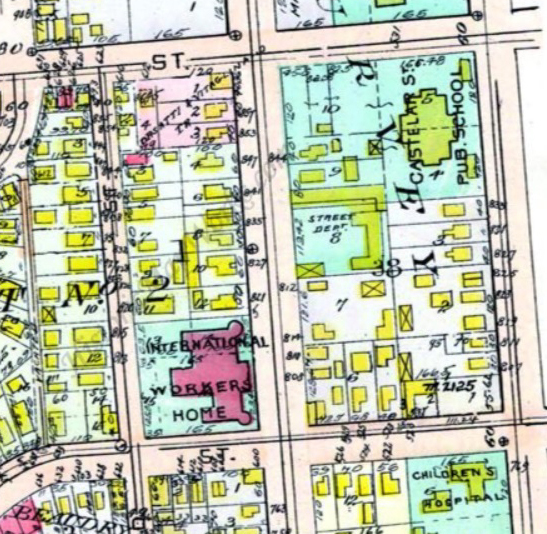 Looking north, this 1914 map (left) shows the site of the International Workers Home, fronting Yale Street, and its relation to the Castelar Street School to the upper right. Harold filmed at the back corner of the home. The Castelar Elementary School still exists, but the main buildings now face Yale Street, with open grounds where the former school stood. Looking west, this 1932 view shows Harold’s corner at Cleveland and Alpine in relation to the Castelar school. 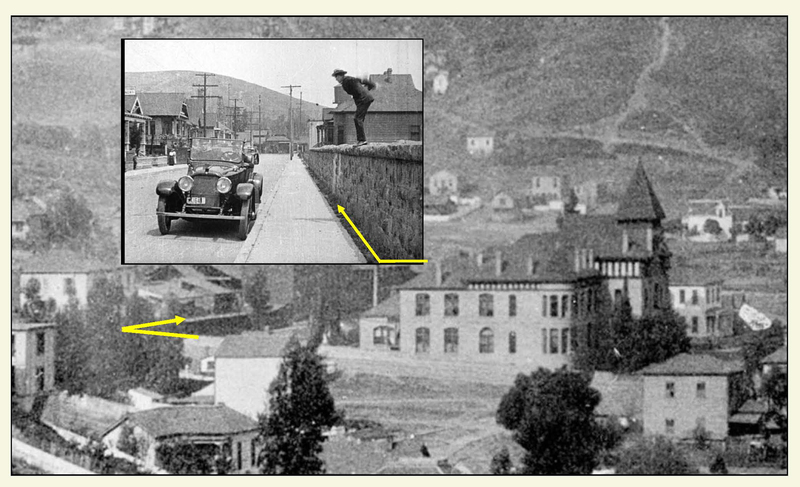 The words “Yale St” appear over the one story garage that replaced the orphanage in 1919. This stretch of Castelar Street is now called N. Hill Street. 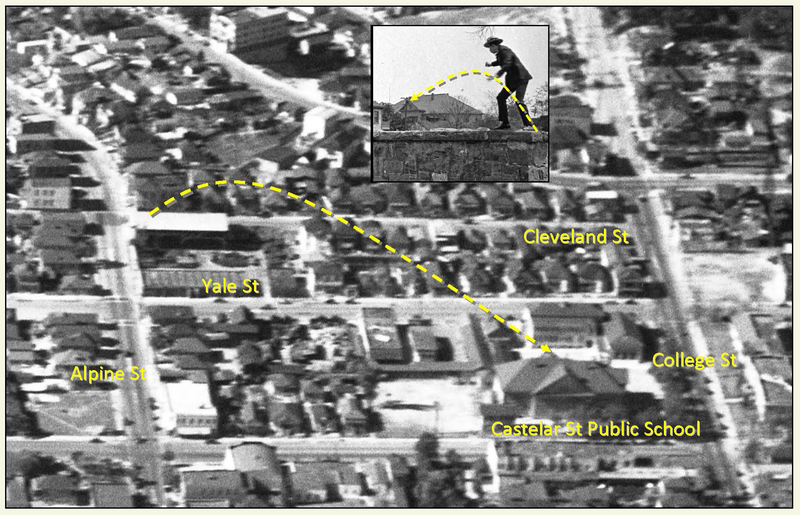 Below, this circa 1928 aerial view shows Harold’s corner (oval) at Cleveland (red arrow) and Alpine, in relation to the back of the Castelar Street School. Another view, looking north up Cleveland (arrow) from the corner of Alpine (oval). LAPL. Two surviving buildings likely appear as shown. In 1906 the west side of Cleveland was the site of a brick factory. 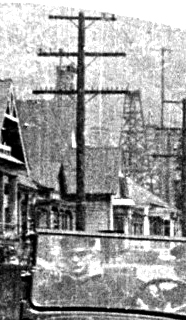 At some point it shut down, and starting in 1910 several homes were moved from elsewhere to the street, including the 815 Lotito home, now lost, appearing to the far left of the movie frame. Christopher Lotito still owned the home in 1945 when some alteration work was done. 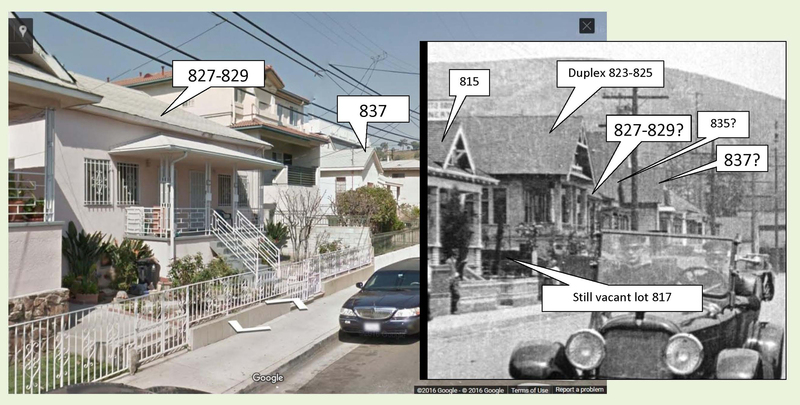 The aerial photos and maps show that in 1919 a vacant lot stood between the Lotito home, and the prominent 823-825 duplex, now lost, identified above. Due north of this lost duplex, and thus directly behind it in the movie frame, stands the surviving 827-829 duplex, as likely identified above. The other surviving home, 837, two sites further north of the lost 823-825 duplex, has a peak on the left front of the house, and is also likely identified above. More Harold news: I am excited to report that I will introducing Safety Last! at the Orpheum Theater on June 25, 2016 as part of the Los Angeles Conservancy’s Last Remaining Seats summer program. I’ve put together a fun program with many new discoveries, including a tie-in between Safety Last! and Clifton’s Cafeteria. Harold’s corner of Alpine and Cleveland today. This entry was posted in Harold Lloyd and tagged Alpine Street, Bumping Into Broadway, Castelar Street School, E.S. Onizuka Street, Harold Lloyd, La Casa del Obero Internacional, Partido Liberal Mexicano, Silent Comedians, Silent Comedies, Silent Movie Locations, Silent Movies, then and now, Yale Street. Bookmark the permalink. You’re still the best cartography archeologist around! Thanks Greg – there is so much untapped history hiding in our old movies. It was fun seeing what unfolded from that one little winery sign. Good detective work from the tiniest clue. I really enjoy seeing these locations unfold and the path you found to get there. Then viewing the (totally unassuming) location today and wondering if the people there now have any idea of the intriguing history surrounding them. Excellent! I was curious about the wall as I was reading, but then I read it is no longer there :(, nor the orphanage. Without your research we would have never have known they existed. Thank you for all your work! Another spectacular discovery — thanks!